Tuesday September 27. A new love affaire after mourning my previous lover. In the setting son I admire her graceful lines, her broad hips, her inviting interior. I think I am in love again. She brought me here safe and sound in challenging conditions. Her predecessor, the 1980 “Fleetwood” will approve in her grave in a cove on the island of Tago Mago. I am looking forward to a great adventure after our honeymoon from Gig Harbor. I have just purchased my TIP (Temporary Import Permit) on line from the Mexican government site. I listed Ensenada as my first port in Mexico. This was the furthest destination on my “real” first honeymoon in June 1959, with Joan, my first wife. I have settled into my new phase of life as a re-born virgin and “Fleetwood” and I will have our sensuous affaire at sea. Sunday September 25. A hot summer day in the first days of autumn. It is 9.30 pm and it is still in the eighties, here in Alameda. 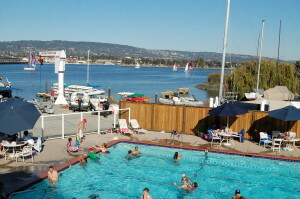 I’m back in the Encinal YC after my three night stay at the Grand marina. This spot is a sailor’s dream. 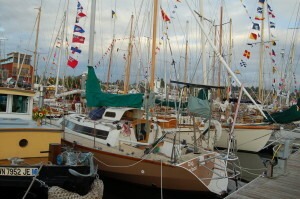 I cannot think of a a place where a sailor can avail himself of all the conveniences within a 5 mile radius, sail makers, yacht brokers, technicians, second hand consignment stores like the Blue Pelican, Svendsen Boat Yard and marine supply store., etc., etc., good restaurants, super markets. In Seattle it would take you two days to reach these conveniences that are here within a short walk or folding bike ride. I stopped in at the Alameda Marina, yesterday. 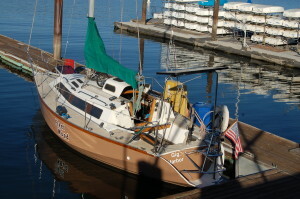 That is where I prepared “Fleetwood” in 2005 after it had been launched from the trailer in February at the Nelson Boat Yard in Alameda. This morning I attended 9.30 am mass at St. Joseph in Alameda, just like I did in 2005. What a lift for the week among the great ethnic mix, Filipinos and other Asians, Latinos, African Americans and whites. The basilica was nearly full. There are four services on Sunday/Saturday vigil. A good size choir and outstanding director and organist. The average age was in the forties. lots of children. The envy of many American parishes and a dream for European pastors. Only the underground persecuted church in China can better this. The gospel Luke 16:19-31 was the familiar parable of the rich man and Lazarus. And I discovered something new in the gathering song: “God whose purpose is to Kindle, now ignite us with your Fire….”. So, is it possible that Jeff Bezos’ inspiration came from this hymn for “Kindle Fire”? I have sold more “SoloMan” books here since my Thursday arrival than I did at the Port Townsend Wooden Boat Festival. The color and black and white print versions are now also available at the Blue Pelican in the Grand Marina. I will be keeping them stocked up from now on. Saturday evening Mark and Meg invited me over for shiskebab and wine on their boat in the Grand Marina and yesterday evening I dined on the club deck with Catherine and Gilles, a French couple members of the Encinal YC. The swimming pool below us was still crowded and a steady parade of sailboats returning under spinnaker from a beautiful weekend on the bay. Thursday Sept 22. A touch of the first autumn gold going through the Golden Gate. And it was also the light at the end of a dark tunnel on this first day of Fall. One of the most asked questions is: “Aren’t you ever scared?” Frankly, these 27 miles from Point Reyes to the bridge turned out to be one of the scariest moments in my memory. It started just before making the left turn at Point Reyes. 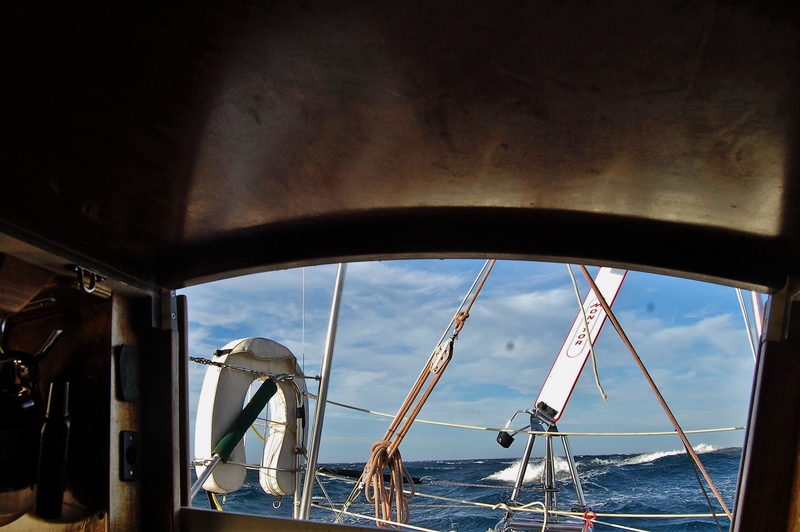 The wind suddenly picked up from the 20-25 knots of the last two days to at least thirty knots. “I’ll have to harden up and will the rudder and the windvane be able to take the added forces? What are my options? 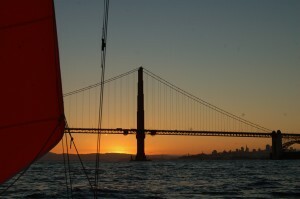 Keep running down wind and pass San Francisco and wait for daylight?” With three layers I was still shivering. Frost warnings were issued for the Napa Valley. The other option was to try and find a spot to anchor for the night. But in the dark in an unfamiliar area this is still hazardous. I decided to try and get as much coverage closer to shore from the strong winds. But the wind just followed the funnel tunnel to the bridge. Now I was committed to it. No turning back against this kind of gale force wind. The waves rolled, curled and broke in a bath of white foam. The boat was tossed and pushed, but the Monitor managed to force it back on course. 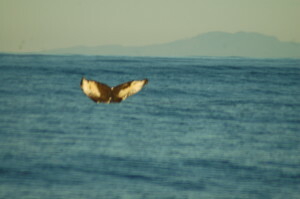 At times “Fleetwood” was riding the crest of a big wave, momentarily surfing. The commercial vessel lanes are clearly marked on the electronic chart and I must be sure to stay out of these lanes. Now, there is the added problem that the alarm bell rings steadily and gives a description of a German container ship and a cruise vessel. But this time they are not showing up on the screen, just the messages with the annoying alarm. I keep clicking the “silence alert”, but a second later it jumps back. There is no time to search for the fix. (Meanwhile I had a flash of genius: turn the sound off……). With the city lights as a back light it is difficult to make out the bridge. I must trust the GPS charts. 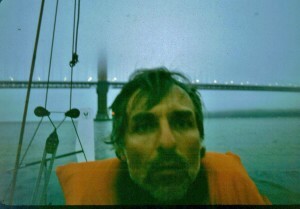 On the final approach to the Golden Gate, hooked on with my safety harness, I disconnected the wind vane and hand steered, actually leg steered because I have to hang on with both hands not to be tossed out of the cockpit. But when I get closer the wind and waves calm down and it is like an anti-climax. Daylight breaks over the hills, I sniff the familiar smell of Eucalyptus. I just happened to have hit slack. I was riding the flood in from midnight until 5 a.m. with a 2.6 knots of maximum current. God is good, it could have been the ebb at max. 4 knots if I would arrived 6 hours earlier at Pt. Reyes. I hate to imagine the size and force of the waves in these wind conditions. Now I am showered and shaved in the Grand Marina in Alameda. It turned out that Encinal YC hosts the wheelchair veteran cruise this Saturday. No room with all the volunteer power boats from the area to entertain our war heroes. I shall be at Encinal from Sunday afternoon onward. 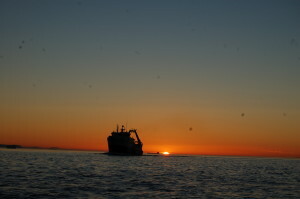 On Monday morning the 12th another sailboat came out of Neah Bay. When I discovered the challenge I had going through the “Hole in the Wall” between Tatoosh Island and Cape Flattery I tried to warn my new company not to follow my example. But they could not hear me. There is a problem with my fixed VHF radio. I need to repair the connection. The hand held works fine for my coastal sailing. Later on I identified the boat by its AIS profile as the Dutch yacht “Anna Caroline” with the famous cruising couple Wietze van der Laan and Anneke Kuysters. 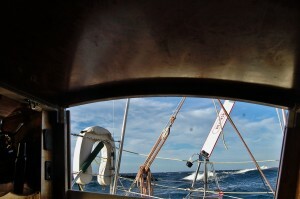 See: http://www.zeilen.nl/nieuws/actueel/column-anna-vakantie/ where Anneke writes a bi-weekly column of their adventures in the leading Dutch sailing magazine . Both couples I met in Newport had run in to them in British Columbia and Alaska. Judy Millard of the Canadian “Veleda IV” gave me their e-mail address. 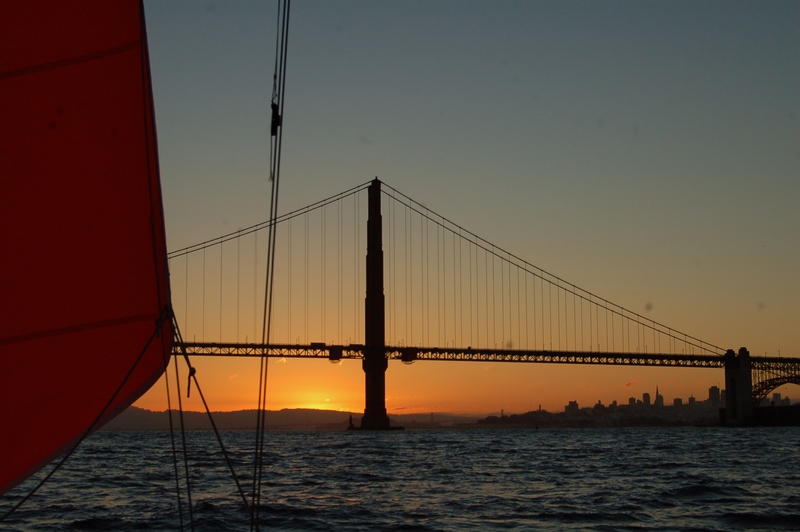 We will meet up on October 2nd after they move the boat from South Beach, San Francisco for their winter moorage and haul out to nearby Emeryville. They have sailed 13,000 nautical miles in the last year. Tuesday, September 20th. I went into town to grocery shop on Friday. It is a long walk across the bridge. A father and son were feasting on the crabs they had caught and just pulled from the steamer. When I asked them for the stairs up to the bridge, they invited me to join them and the Dungeness crab was delicious. After I listened to the weather VHF report, I decided to stay until Sunday morning. 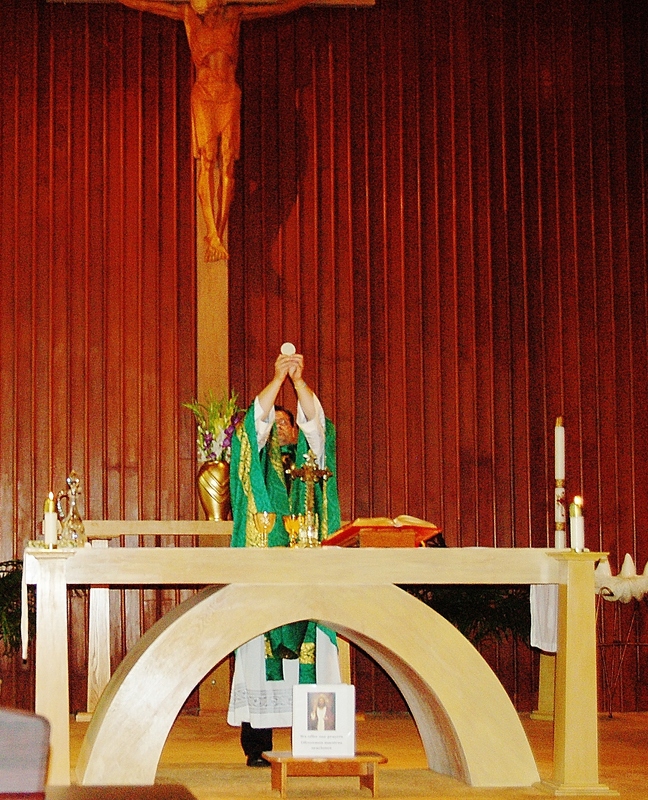 The last shuttle bus on Saturday dropped me near the Sacred Heart Church for the 5.30 p.m. Saturday mass. Need to keep a balance with my previous Rogue bar scene. It was raining and a long walk back. The very first couple, at church, I asked if they were crossing the bridge going home turned out to be in the same RV/Marina facility and dropped me right at the dock. They are from Coos Bay, Oregon. In the seventies and eighties, I shipped most of my forest products from Coos Bay and made frequent visits there and the surrounding sawmills. One dear business friend was Stu Lyons, the operator of the main shipping terminal. He died in his forties. My ride was a schoolmate of Stu and lived close to their home, where I was an occasional visitor. It was foggy and no wind when I left at 8.30 a.m. A little breeze came up from the SW, not enough to sail on but enough to motorsail under the main sail. The VHF weather forecast for the evening gave me some concern, NW 20-25 with gusts to 30 mph. I started with the full main and my 140 % head-sail, then started with one reef and ended up down to three reefs before I had to pack up the main and have been sailing on just the brand new red colored storm jib. The seas built up quickly and the boat was whipped around a lot and took a number of waves across and into the cockpit. A bit scary. This afternoon it calmed down but not enough to add any more sail and now in the evening it is picking up again. But I managed to cook my dinner of smoked chicken breasts and stir fry vegetables. Just in time. My laptop is next to my bunk and it warns me through the wireless connection to the AIS transponder when traffic approaches. So, I am able to get some sleep in the meantime. Saturday, Sept 17. A rainy day in Newport, Or. Glad that I am not out there sailing in the slow steady down pour. The RV vacationers have moved inside and I hope they have as much indoor chores as I have. 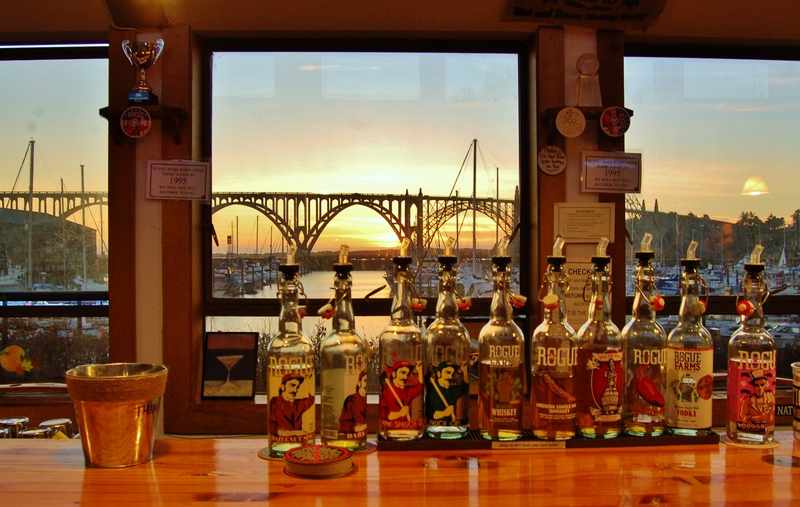 The downtown area spread down Hi-way 101 is a long walk, across the long bridge over the Yaquina River. There is a shuttle bus but it only comes every 45 minutes and the last one leaves here at 4.46 pm. I plan to take it and attend the 5.30 pm Sunday vigil mass and leave port at 8 a.m. on the end of the ebb tide. Today the winds are from the south west and strengthening to 20/25 knots this evening. Right on the nose. But the forecast is for a west wind in the morning and then gradually going back to the standard N.Westerly. I will be mooring at the Encinal Y.C., in Alameda and expect to be there by this coming weekend. Possibly Thursday, if I do not make another stop. On my walk into town yesterday I recognized the landmarks from the visits here as crew from Gig Harbor to San Francisco in or around 1991 with Larry Burcar on his “Siren” and later with Roger Rue in 1993. Both friends have passed on since. It was on both occasions that we stopped in Fort Bragg and it remains one of the most interesting time warp memories. A town where the clock stopped in 1961. But for all I know it will be a disappointment, that happens when you outlive your good friends. But there will be new ones. I already made a number new friendships, in Port Townsend and here in Newport, an Ontario Canadian Couple who have been cruising the world for the last thirteen years, Judy and Aubrey, they left yesterday and a Kiwi-German couple on “Rhapsody”. They are on their way back to New Zealand after a large circle tour of the Pacific from N.Z. along Asia, Japan to the Aleutian Islands and down from Alaska. Kerrin is from the small German North Sea island of Föhr and Steve is a Brit who has been living in New Zealand for the last 16 years. Rhapsody is a beautiful well built traditional design of Athol Burns, buit in New Zealand. The hull is planked in Kauri. They were in the Wooden Boat Festival with me in Port Townsend. 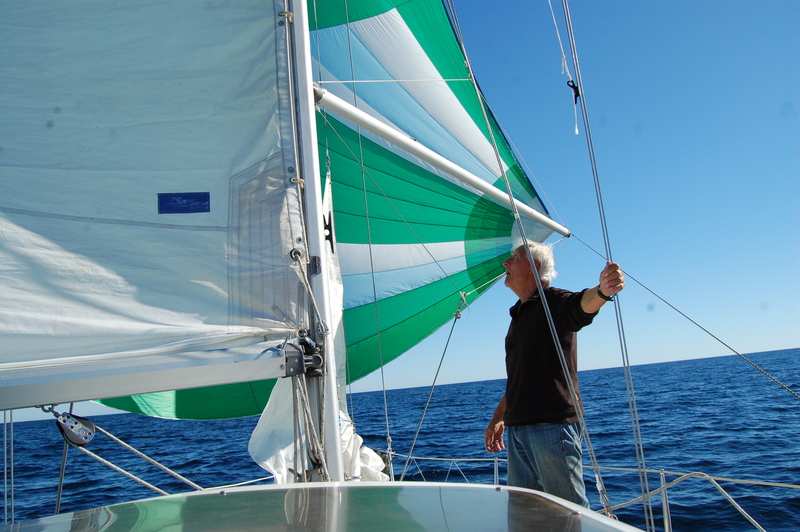 In reaching and running downwind I use the outboard spinnaker lead to tweak the head sail at a better angle. This boat has much better hardware than I had on her predecessor. Thursday Sept. 15. Newport, Or. 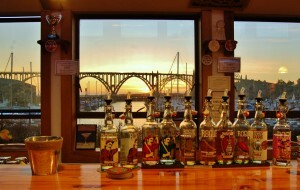 The bridge at Newport over the Yaquina River. I arrived here at the breakwater entrance at 3 pm. After a good hot shower I feel a lot better. Right now I am waiting for my load of laundry to finish in the dryer. I am at the South Beach Marina. A huge marina with an even bigger RV parking area. I peeked in through the windows of the community hall, white haired ladies playing cards. Their men outside cleaning their catch of the Pacific Ocean. When I grow up I want to join them. Port hopping down the coast takes time. This stop adds a day just to get back far enough to be outside of the fishing fleets and crab pots. The predominant NW wind are more reliable away from the coast. 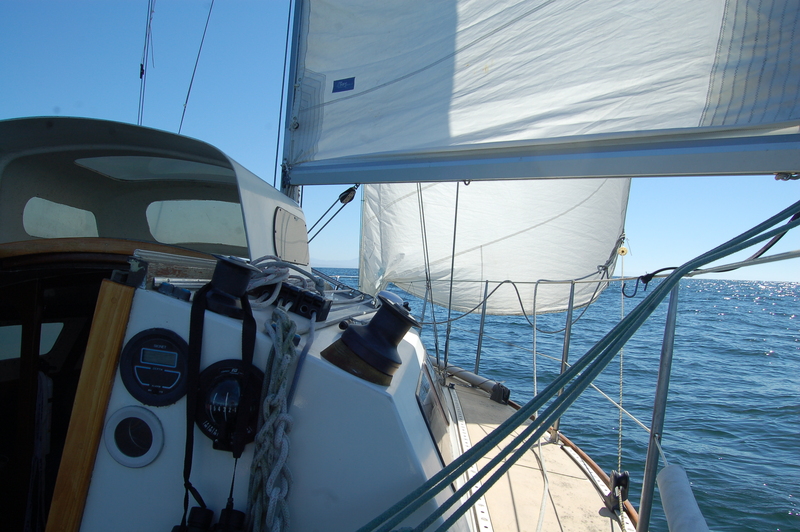 Coming back into the coast, yesterday, I had to tack into SW winds. Though the AIS allows me to sleep with the laptop next to me and checking the alarm, nine times out of ten, there is little I need to do. It shows me the direction and speed and it calculates the time of the AIS target crossing my track. A terrific new tool for a single handed sailor. Tuesday Sept 13 2016 Off the Olympic Peninsula Pacific Coast. It is 12.30 and since 9.30 this morning I have managed to cover 3 ½ nautical miles. The marine radio forecasts 5-15 knots of a N.W. wind. I’d take the 5 knots to just have steerage. I woke up at 2.20 this morning and the boat was dead in the water. Just slopping around in the left over waves and swell from this Monday’s strong winds. I was doing 7 knots under just the 135% genoa jib, yesterday afternoon. It makes no sense to crank on the engine. I went back to sleep after dropping the sails. When I woke up around 8 a.m. a tiny breeze came up and since then it has been stop and go. Frustrating! The waves collapse the sails. But it is a beautiful warm late summer day. With the sleep deprivation of that first Sunday night, my visitors are back: the voices. I hear a lady in a high pitch voice talking in the peak of the boat, but I cannot make out the words. When I woke up at 2.30, with the boat dead in the water, I swore that there were a few people in a dinghy checking out the abandoned boat. They were horn playing on kelp tubes, I looked out but saw no one. Often it is just lines rubbing in the movement of the swells. 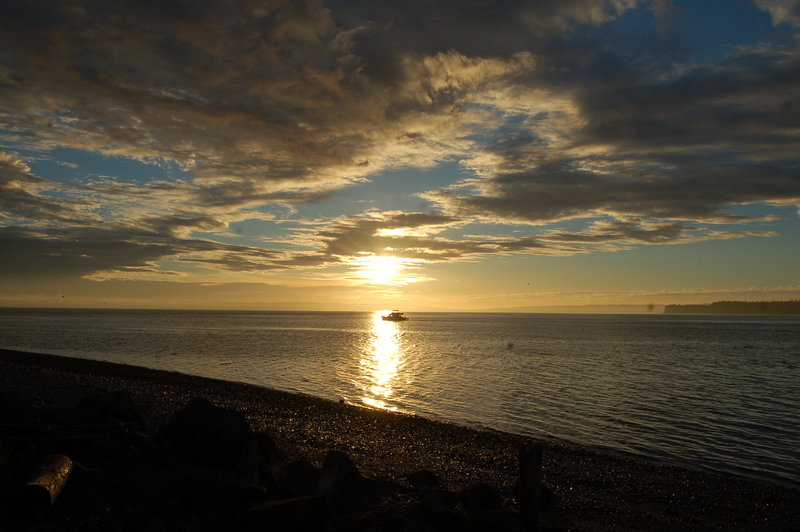 I left Port Townsend at 15.30 on Sunday. My standard departure day, over the course of the circumnavigation. 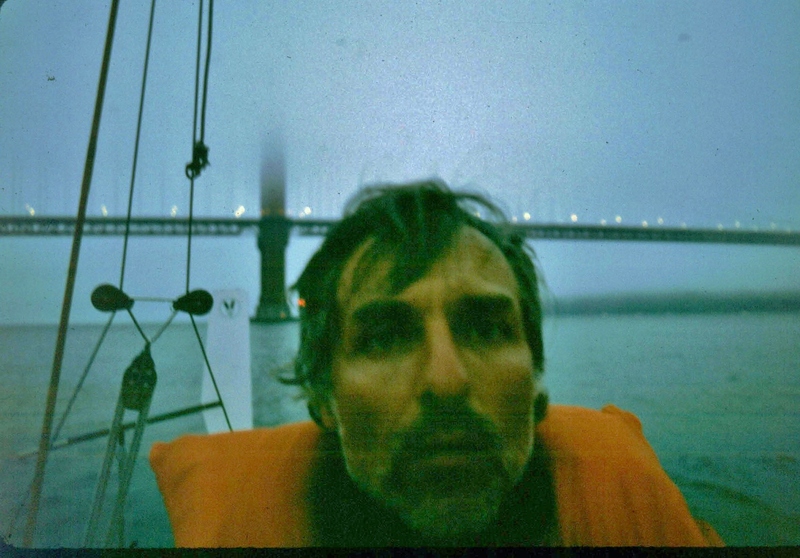 I had a nice sail in the Strait of San Juan de Fuca until midnight and then had to resort to engine power, all the way until I reached Cape Flattery entering the Pacific at around 10.30 on Monday. I decided to take the shortcut though “The Hole in the Wall” narrow passage. This time it was very rough with a strong ebb and a strong following wind. I had to use all my force to control the steerage in the whirlpools. 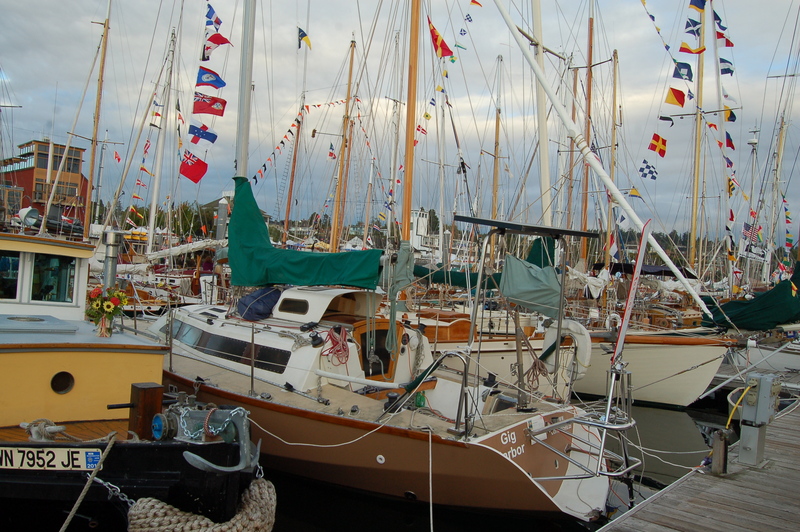 From 1976 until 1993 I hardly missed a sailing in the annual Memorial Day short and medium course of the Swiftsure Lightship Classic regatta, in the Strait of Juan de Fuca, from Victoria, B.C., the area brings back the memories. 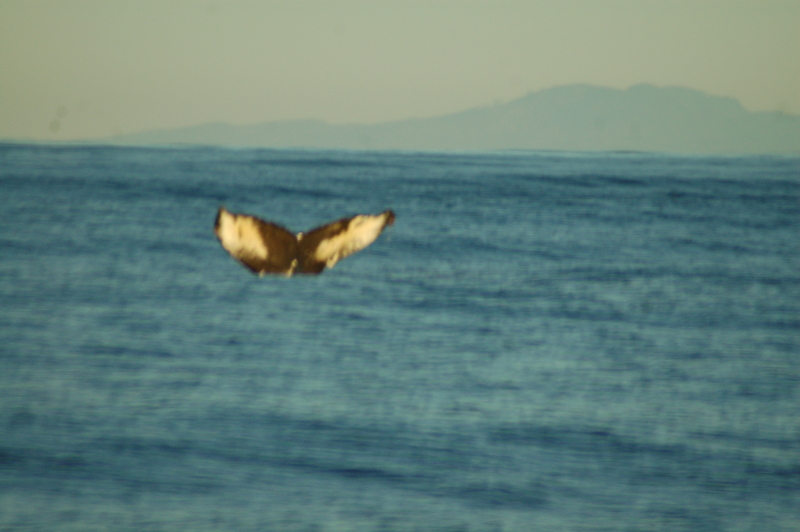 About 5 miles east of Neah Bay I saw two Humpback whales feeding, about a couple hundred feet from the boat. I took a number of pictures but I am having automatic focus problems with my old Nikon D-50. Here is a so-so picture of the enormous tail of one of the two. Once passed by, I heard this loud plunge on the surface. I just saw the end of a breech. When I looked across the Strait I could see 4 more, besides the two whales near me, spouting at the same time, it looked like the Yellow Stone geysers. 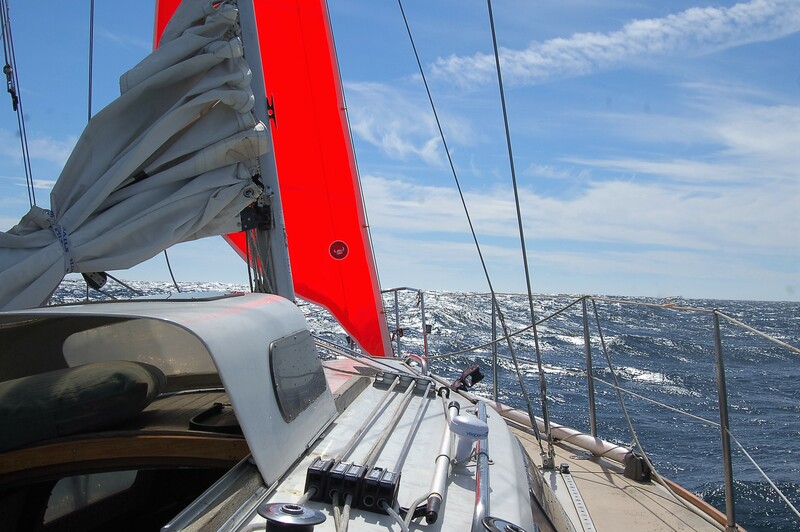 This afternoon the promised 5-15 knots slowly filled in. I hoisted the spinnaker for nearly three hours. A perfect sail. I enjoyed the ride, perched next to the windvane on the lee side against the stern pulpit. How many almost 80 years old men get to have this much fun? I forgot all the frustrations of the night and the morning. By the time it got to the 15 knots it started to become a chore to keep up with it. I did a perfect spinnaker douse. The chute is repacked for its next opportunity. This is a larger chute than I had on the original “Fleetwood”, which had a taller mast and a larger main sail but smaller head sails. It was a fractional sail plan. The chute has the same green and white panels as my old spinnaker, but it has a few light blue panels in it as well. to check the position and the direction of the vessel I am approaching. It turns out to be a fishing boat. I am just abeam of Grays Harbor, about 60 miles away from shore. Wednesday Sept 14. The NW wind of between 10/15 knots stayed with me through the night, making for good progress and a good night sleep. At 10 am I had covered over 94 nautical miles towards my destination for the 24 hours. Not bad, since I did not sail it straight to keep better boat speed. But the wind died down again. I tried the spinnaker once more but there was too little wind to fill it. Down again and repack and sort out all the lines again. I motored for 45 minutes until the breeze slowly filled. Right now, 16.45 hour, the wind has gone from NW to WSW and heading for Newport, Or., at this rate I should be in by tomorrow, Thursday, evening. This is not quite the same as the almost daily, text only, blogs I posted, from June 2009 onward, through SailMail. But I expect to have no more than a week between posts, since my ocean crossing days are over, (I tell myself..). Unless there is a sudden deterioration in the weather forecast, I shall most likely make just one stop between here and San Francisco. Probably, Fort Bragg, California. Sunday Sept. 11 The Blue Peter is hoisted. I went to 8.15 mass at Our Lady of the Sea here in Pt. Townsend. Tuesday evening was the sent off in Gig Harbor and I am still overwhelmed by the outpouring of friendship, gifts and love from the friends and family. Excuse the dragging fenders. The mismatched sail numbers. 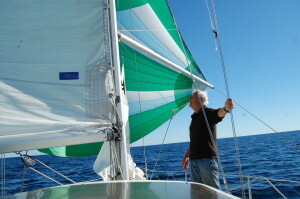 The dacron head sail was bought on Craig’s list, to replace the two original mylar sails that are to delicate to single handle. I anchored the night ahead of the Pt. Townsend canal and was put in my slip at the Wooden Boat Festival on Thursday afternoon. It and Friday were magnificent late summer days. Saturday was blustery and partial cloudy. Today is beautiful once more and the forecast is good for the sail south. So, I hope to be on my way this afternoon at 14.00 h when the ebb starts. Seth came up from Portland to assist with unfinished software issues, for the new laptop, etc. Several of my North Washington and Vancouver B.C. friends came yesterday to say Bon Voyage. The De Lorme tracker will from hereon record my location, see upper right hand corner.